Can anyone ID what this brown, spaghetti-esque mass is growing on my rock? It is about 3-4 inches across and almost looks like a mass of feather duster tubes or something but has a texture more akin to a sponge of some sort. Upon further research based on the livestock I have in my tank I believe this may be a mass of Sea Hare eggs. Also interesting and noteworthy for those reading I dosed my tank with a small amount of H2O2 the past few days <1ml per 10 gallons. I have seen some research that has shown additions of hydrogen peroxide into seawater causes spawning responses in some mollusks. Good call on the eggs , as that is indeed what they are. Now from what I do not know but have seen eggs laid out like that before. Ooh, that's scary looking! If it is sea hare eggs, now is the time to decide if you want thousands of them in your tank, and take appropriate action. I am in the process of removing hundreds of them from my tank. Kinda tedious! I wish I had removed them at the egg stage. In my opinion, one is cool, thousands, not cool. Why would you not want them? I guess it depends on the kind of sea hare and the kind of tank you have. For example, my tank is a macro algae and seagrass tank. The sea hares I have eat macros. They have almost wiped out one species of caulerpa that I'd prefer to keep. That's why I do not want them. I suppose if you had a micro algae problem and your sea hares ate micro algae, you would want them. But what happens when thousands of sea hares run out of food? I love natural solutions. But that is a huge egg mass. Thousands of anything bigger than pods is a bit much in the confines of an aquarium. I'm not a sea hare expert, so I may be overlooking something. Why WOULD you want them? Ah I see. Well I have the opposite problem lol. My tank is basically an unplanned refugium. My tank was spotless a few years ago and I had a bad crash while out of town and everything died. I kept the rock and sand. Had a bad cyano problem for a year. 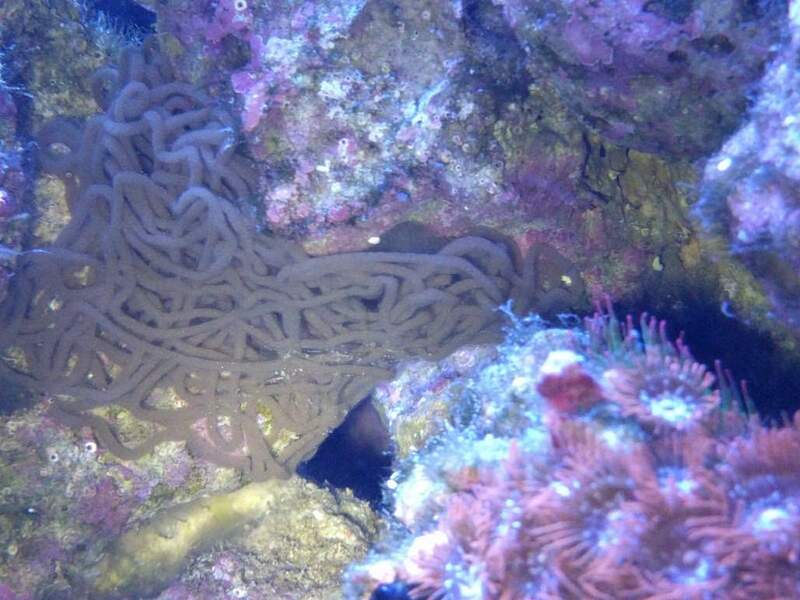 Got rid of it... And now have a bad hair/turf algae/halmaeda problem. This is the first I've heard of sea hares reproducing in a tank and I think I would love to have that happen. Thanks, mikenh77. Now I see your side of it. At least you can grow halimeda. I've had no luck with it. I thought it was cool too, when sea hares reproduced in my tank, until I realized they were wiping out my caulerpa racemosa. It's kinda like the bristle worm thing. They're great detrivores but when their population explodes and your tank is literally crawling with them, it's just a bit too much. I'm curious, m3ch, have you decided what to do with your giant egg mass? So far I have left it be to see what happens. I don't have any valuable macros that I am worried about them eating if they do happen to hatch. While I can definitely see the downsides of having that many tiny beings hatching in my tank I think part of what makes this hobby interesting is getting a chance to observe an ecosystem in a box. Will update this thread if anything happens but thus far they haven't changed.